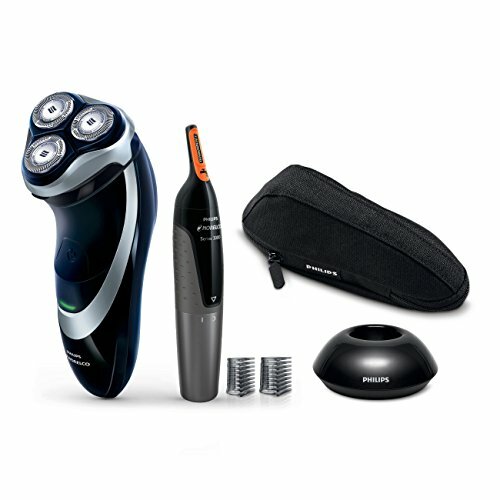 Philips Norelco Shaver 4300provides you a fast and comfortable shave with less irritation. Dual Precision heads are designed with slots and holes to quickly and comfortably shave both long and short hair. With the Flex and Float System, heads follow the contours of your face, allowing for better contact with your skin and for catching more hairs - resulting in a closer, faster shave. The patented Lift & Cut System gently lifts hairs to comfortably cut below skin level. The integrated pop-up trimmer conveniently trims sideburns and moustaches. The Lithium-ion battery delivers 45 minutes of cordless shaving after an 8 hour charge. A 3 minute quick-charge provides enough power for one cordless shave. The shaver is fully washable, simply rinse device under faucet for easy cleaning.